Nursery rhymes sung sweetly can take us back to childhood. But deep inside many of those childhood favorites is… a hint of something dark. 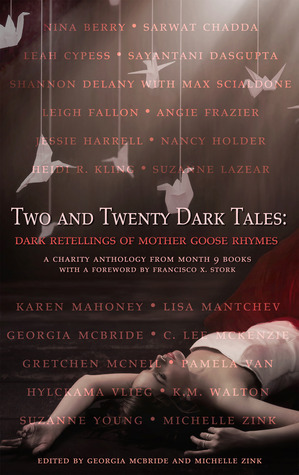 TWO AND TWENTY DARK TALES: Dark Retellings of Mother Goose Rhymes imagines dark and sinister things amuck in Mother Goose-land. From familiar rhymes, to some of the more obscure, TWO AND TWENTY DARK TALES is a must read for anyone who enjoyed Mother Goose rhymes as a child, but has come to love the darkest of tales. Proceeds from the title through 5,000 copies sold, will be donated to YALITCHAT.ORG. Authors are donating their advances to a charity of their choice. Love it! The cover is pretty too! I'll definitely be picking this one up.